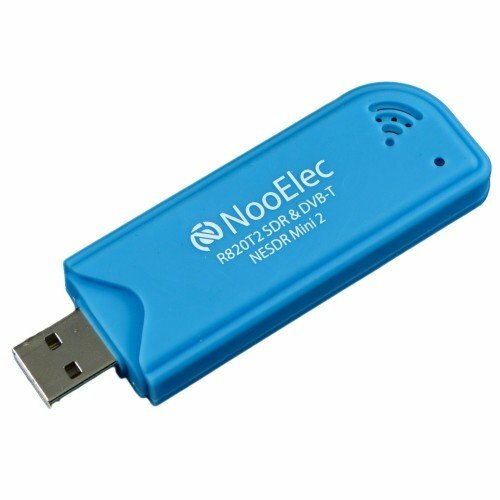 Nooelec have recently begun selling RTL-SDR dongles with the R820T2 tuner chip in them. The R820T2 is a small upgrade over the R820T as it has slightly better overall sensitivity (seems to be around 2-6 dB better). Another advantage to the R820T2 is that Oliver Jowett’s experimental driver for HF reception works much better with this chip. The reason is that the R820T2 has wider IF filter bandwidths which improves the mechanism that the experimental driver uses to obtain HF frequencies. Previously, we posted about a Japanese RTL-SDR experimenter who replaced the R820T chip in a standard dongle with a R820T2 chip and also saw improved sensitivity. The recently available for preorder Airspy software defined radio also uses the R820T2 tuner in its design. Email from NooElec says in about a month they will have NooElec NESDR Mini 2+ version with TCXO. Did they mention a price for the NooElec NESDR Mini 2+ by any chance? That is price for the non plus version without tcxo. is it compatible with standard R820T programs like dump1090 etc.? Yes, everything that works with the R820T should work with the R820T2.